A ford is a shallow place with good footing where a river or stream may be crossed by wading, or inside a vehicle getting its wheels wet. A ford may occur naturally or be constructed. Fords may be impassable during high water. 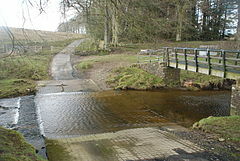 A low water crossing is a low bridge that allows over a river or stream when water is low but may be covered by deep water when the river is high. In New Zealand, however, fords are a normal part of major roads, including, until 2010, along State Highway 1 on the South Island's east coast. As most inter-city domestic passengers travel by air and as much cargo goes by sea, long distance road traffic is low and fords are thus a practical necessity for crossing seasonal rivers. 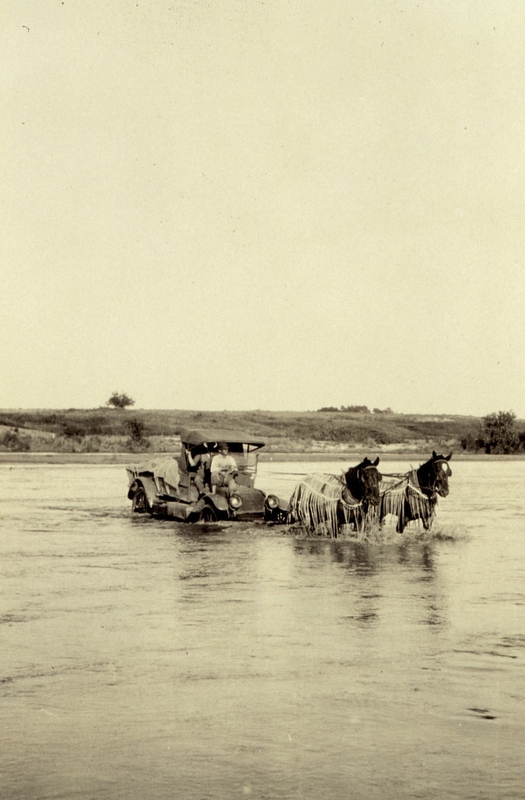 In dry weather, drivers become aware of a ford by crunching across outwash detritus on the roadway. A Bailey bridge may be built off the main line of the road to carry emergency traffic during high water. ^ Thompson, Della, ed (1995). The Concise Oxford Dictionary of Current English (Ninth ed.). Oxford. ISBN 978-0-19-861320-6. ^ "End of the road for last traffic fords left on State Highway 1". Media statement. NZTA, Christchurch Regional Office. 28 December 2015. https://www.nzta.govt.nz/media-releases/end-of-the-road-for-last-traffic-fords-left-on-state-highway-1/. Retrieved 29 September 2010. ^ "An online guide to every UK ford, watersplash and tidal road". wetroads.co.uk. http://www.wetroads.co.uk. Retrieved 2011-09-23. This page uses content from the English language Wikipedia. The original content was at Ford (crossing). The list of authors can be seen in the page history. As with this Familypedia wiki, the content of Wikipedia is available under the Creative Commons License.